ThemPra’s Diamond Model (Eichsteller & Holthoff, 2012) symbolizes one of the most fundamental underpinning principles of social pedagogy: there is a diamond within all of us. As human beings we are all precious and have a rich variety of knowledge, skills and abilities. Not all diamonds are polished and sparkly, but all have the potential to be. Similarly, every person has the potential to shine out – and social pedagogy is about supporting them in this. Therefore, social pedagogy has four core aims that are closely linked: well-being and happiness, holistic learning, relationship, and empowerment. The overarching aim of all social pedagogic practice is to provide well-being and happiness, not on a short-term needs-focused basis, but sustainably, through a rights-based approach. While the terms ‘well-being’ and ‘happiness’ are sometimes seen as one and the same, in our understanding they are notionally different: happiness describes a present state whereas well-being describes a long-lasting sense of physical, mental, emotional and social well-being. 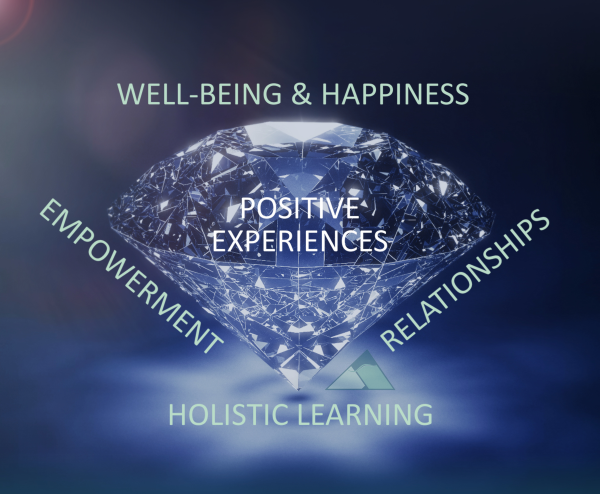 In combination we can get a holistic view of a person’s well-being and happiness. Importantly, well-being and happiness are very individual and subjective: what causes happiness is highly individual. As a result social pedagogical practice is very context-specific and highly responsive to the individual rather than adopting a one-size-fits-all approach. ‘Learning is the pleasant anticipation of one’s self’, according to the German philosopher Peter Sloterdijk. In this sense, holistic learning mirrors the aim of well-being and happiness – it must be seen as contributing to, or enhancing, our well-being. Learning is more than what happens at school, it is a holistic process of realizing our own potential for learning and growth, which can take place in every situation that offers a learning opportunity. Holistic learning is a life-long process involving ‘head, heart, and hands’ (Pestalozzi). Social pedagogy is about creating learning opportunities, so that people get a sense of their own potential and how they have developed. As we are all unique, so is our potential for learning and our way of learning and development. Central to achieving these two aims is the pedagogic relationship. Through the supportive relationship with the social pedagogue a person can experience that someone cares for and about them, that they can trust somebody. This is about giving them the social skills to be able to build strong positive relationships with others. Therefore the pedagogic relationship must be a personal relationship between human beings – social pedagogues make use of their personality and have to be authentic in the relationship, which is not the same as sharing private matters. So the pedagogic relationship is professional and personal at the same time, thus requiring from the social pedagogue to be constantly reflective. Alongside the relationship, empowerment is crucial in order to ensure that an individual experiences a sense of control over their life, feels involved in decisions affecting them, and is able to make sense of their own universe. Empowerment also means that the individual is able to take on ownership and responsibility for their own learning and their own well-being and happiness, as well as their relationship with the community. Social pedagogy is therefore about supporting people’s empowerment, their independence as well as interdependence. In order to realize these core aims, social pedagogy has to be about providing positive experiences. The power of experiencing something positive – something that makes someone happy, something they have achieved, a new skill they have learned, the caring support from someone else – has a double impact: it raises the individuals self-confidence and feeling of self-worth, so it reinforces their sense of well-being, of learning, of being able to form a strong relationship, or of feeling empowered; and by strengthening their positives the person also improves their weak sides so that negative notions about their self fade away. Due to its inter-disciplinary roots, social pedagogy offers a conceptual framework that can help guide holistic practice. As an academic discipline, social pedagogy uses related research, theories and concepts from other sciences to ensure a holistic perspective. This means that in realizing those core aims there is a lot of inspiration to be taken from what research and concepts tell us about related areas. All four aims point at the fact that social pedagogy is about process. Well-being and happiness, holistic learning, relationship, empowerment – none of these are a product that, once achieved, can be forgotten. This is why it is important to perceive them as fundamental human rights that we all constantly need to work on if we want to ensure that nobody’s rights are violated or neglected. This perspective of social pedagogy means that it is dynamic, creative, and process-orientated rather than mechanical, procedural, and automated. It demands from social pedagogues to be a whole person, not just a pair of hands. It is therefore not surprising that many professionals in the UK and elsewhere have taken a keen interest in social pedagogy and have found it possible to relate both at a personal and professional level to its ethical orientation and ambition to provide children and young people with the best possible life experiences. You can now order the Diamond Model as a poster or set of postcards via this link.